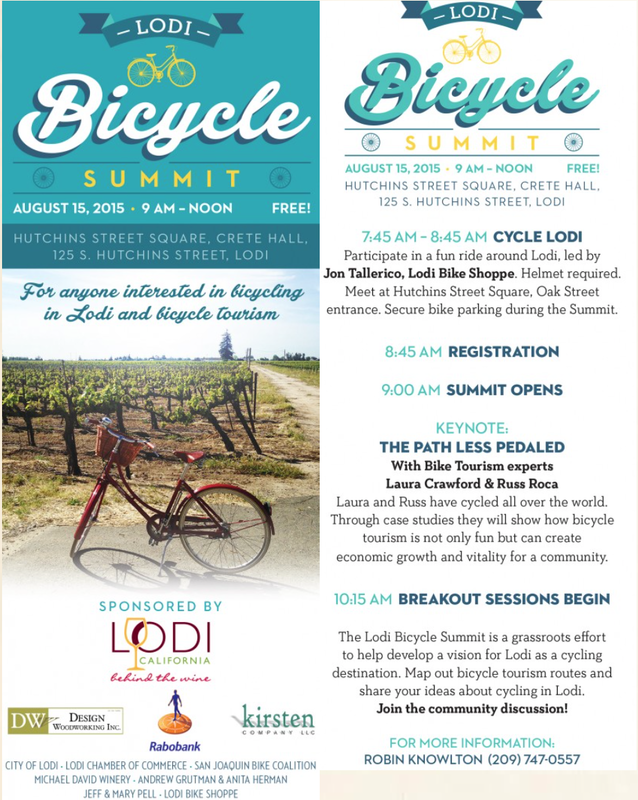 We’re excited to announce that we’ll be heading to Lodi, California next week to present and participate in their Bike Summit. This will be our first visit to Lodi, but our favorite wine comes from the region, so we know we’re headed to a good place! We’ll be speaking about bike tourism and the potential for the area – and we hope that it sparks some good conversation. We’re also excited to be flying down a few days before the Summit to ride some of the routes that they’re proposing as designated bike tourism routes – some short mileage, some long, some through a quiet nature preserve, others stopping for wine and beer tastings. If you’re in the region, we hope that you’re planning to join us and local community members at the Summit. No doubt it will all be great fun and a lot of valuable work – and definitely find us to say Hi. I am looking forward to Saturday.